Slackware is the first widely-used Linux system, which is still developing. Slackware has existed since 1993. In comparison with for example Ubuntu and Linux Mint, many people believe that Slackware is "difficult". Any novice can quickly learn to use Ubuntu they say. My remaster of Slackware 14.1, which I call SlackEX 14.1/current 64 bit Linux Live DVD, is however just as easy to use as Ubuntu and/or Linux Mint. Some tend to complain that the Program Management in Slackware is awkward. That was perhaps earlier the case, but not anymore. Now we have the Application Managers Slackpkg and GSlapt - a GTK version of slapt-get. They are a piece of cake to use! Users of Synaptic will feel at ease with GSlapt. 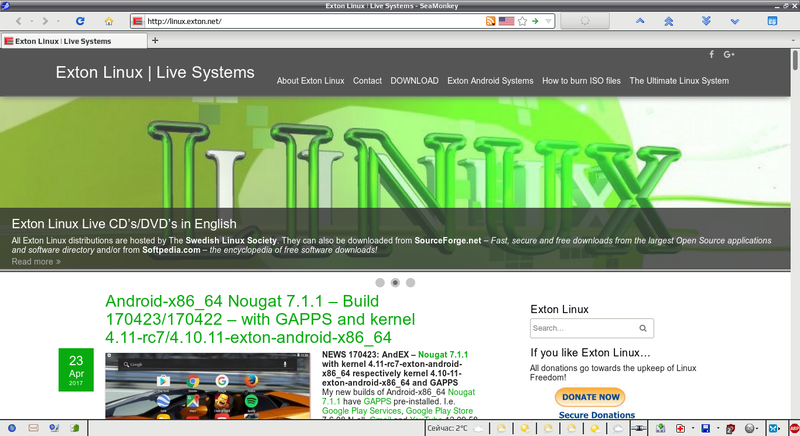 I have replaced kernel 4.0.2-x86_64-exton with kernel 4.1.1-x86_64-exton with support for “everything”. KDE is downgraded to version 4.10.5 from version 4.11.1. All other component software is also upgraded to the latest Slackware version by now. I may mention in particular GParted 0.17.0 (latest, not in Slackware’s repositories), VirtualBox 4.3.28 (latest, not in Slackware’s repositories), AbiWord 2.8.6 (not in Slackware’s repositories), Gimp 2.8.10 (installed from source), GSlapt 0.5.3h, Firefox 31.7, Thunderbird 31.6, Samba 3.6.8 and GCC 4.8.2. Furthermore I have installed Grub2, which can be used as boot loader (if you want) after a hard drive install. Study the full package LIST. EXTON Linux Live Systems — проект шведского Linux сообщества по созданию готовых к использованию Live систем различных дистрибутивов Linux. Каждая сборка имеет собственную домашнюю страницу и страницу на SourceForge.net, так же есть FTP с актуальными сборками. Домашняя страница проекта не открывается. Но похоже, что проект жив. Вот страница разработчика https://sourceforge.net/u/exton/profile/ со ссылками на сборки. Хорошо, что я сюда приехал - наконец, я разрешу свою проблему. Привет.